Goodreads says, " The golden skies, the translucent twilight, the white nights, all hold the promise of youth, of love, of eternal renewal. The war has not yet touched this city of fallen grandeur, or the lives of two sisters, Tatiana and Dasha Metanova, who share a single room in a cramped apartment with their brother and parents. Their world is turned upside down when Hitler's armies attack Russia and begin their unstoppable blitz to Leningrad. Yet there is light in the darkness. Tatiana meets Alexander, a brave young officer in the Red Army. Strong and self-confident, yet guarding a mysterious and troubled past, he is drawn to Tatiana—and she to him. Starvation, desperation, and fear soon grip their city during the terrible winter of the merciless German siege. Tatiana and Alexander's impossible love threatens to tear the Metanova family apart and expose the dangerous secret Alexander so carefully protects—a secret as devastating as the war itself—as the lovers are swept up in the brutal tides that will change the world and their lives forever." The story opens up during WWII Russia with siblings Tatiana, Dasha, and their brother living in close quarters along with their parents and grandparents. Russia is on the brink of war, so to keep Pasha, Tatiana's twin brother, safe as he is old enough to be in the Red Army, they send him to summer camp away from the city of Leningrad with the hopes that he would avoid the war. Dasha, Tatiana's oldest sister still is unmarried and lives at home. However, her very full social life keeps her out late; in fact, she has met someone special. Hitler has broken the nonaggression pact with Stalin and has invaded Russia, which obviously means war is even closer on the horizon now. Tatiana is only sixteen years old, but one night when she is out getting ice cream she can't help but notice a solider in the Red Army and he can't help but notice her as well. They hit it off despite the fact that he is older and to complicate matters further, she finds out that this is the guy Dasha has been seeing. Things start to get really tough for the Metanov family as there are food rations and more upsetting complications from war to come. 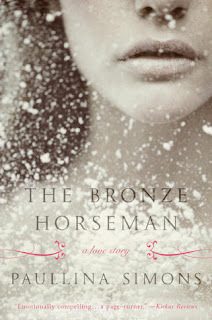 Paullina Simons' sweeping saga, The Bronze Horseman, is about family, love, survival, and war. It is a page turner not only filled with a lot of historical details, but a lot of romance as well. 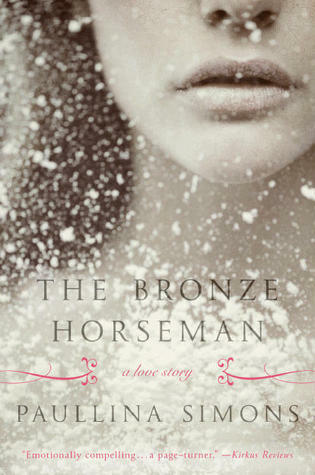 Tatiana really grew on me as she got older and more mature in The Bronze Horseman. At first her naivety was troublesome as well as her forgetfulness, but as the story progressed, I really enjoyed her journey. My heart went out to her countless times and although I didn't always agree with her choices, I still cared a lot about her plight. Dasha, on the other hand, was a tough pill to swallow. At times, I felt badly for her, because the readers know that her boyfriend likes her younger sister. Yikes. But even before she comes to realize this, she treats Tatiana horribly. In fact, Tatiana's entire family treats her poorly to the point where she's like Cinderella doing anything and everything for them. This irked me to no end. Alexander, the solider that Tatiana feels a strong connection with, is also a compelling character in The Bronze Horseman. He isn't just your average Red Army solider. His back story is really intriguing and like Tatiana, I didn't always agree with his choices, but I sure did care about his story. I wanted him to come clean to Dasha about his feelings for Tatiana, but of course there were some major complications. The course of true love never did run smooth, right? The war was like a character in and of itself in The Bronze Horseman. Simons did a great job creating a sense of place and the complications that WWII brought to many people in Leningrad. I had no idea how badly the city suffered. It brought tears to my eyes to think of what the people had to endure. Between the rations, the starvation, and the bombing it was all heart wrenching. Often when we think of the horrors of WWII, we think of the Holocaust and Pearl Harbor, and while that is obviously horrific, I wish more people would talk about the Siege of Leningrad. It lasted two and half years and caused the greatest destruction as well as the largest loss of life in a modern city! I was horrified and so deeply saddened as Simons made it feel very real. Now The Bronze Horseman isn't just all about history. There are some major swoon-worthy and steamy moments in this novel. If you don't like a lot of romance in your historical fiction, this one may not be for you, but I, on the other hand, thought it was a nice compliment to such a serious story. I adored the romance between Tatiana and Alexander - truly an epic love story. Tatiana had to grow up a lot in my eyes, too. I just love how extensive this novel is. Nothing about it was easy but I've read far more exhausting angst, believe me. Lol. Haha. Yes! You are so right. Do you think you will continue with the series? Thanks for visiting, Joy! I have read about The Siege of Leningrad before in Kristin Hannah's book Winter Garden. 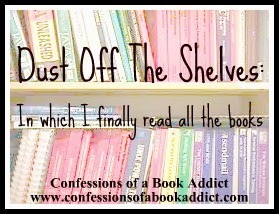 If you haven't read that one yet, I recommend it.